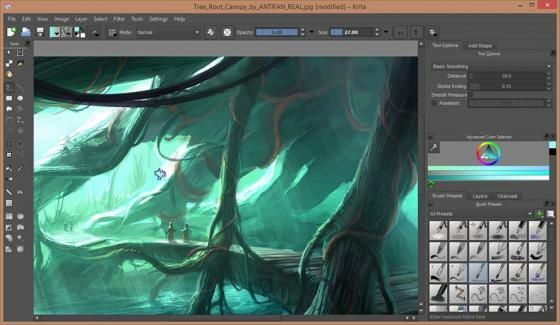 Home » Tech Buzz » Work and Play with Krita! ﻿Work & Play Using Krita! Do you use GIMP for digital painting? Or are still stuck with Photoshop and you either upgrade and pay for another license or lose technical support and get buggy software? 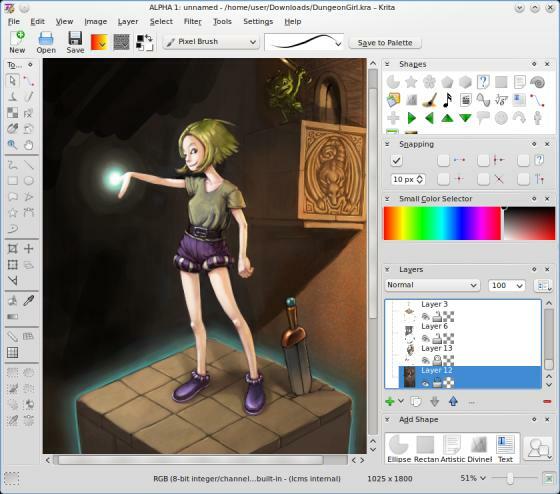 Krita, the KDE (Linux distro) digital illustration app has similar features with GIMP and is better suited for digital painting and illustration. Open source apps like Krita are upgraded by a development every season and you get to update your installation for FREE. As an artist's tool, Krita has better color management, high bit depth images and powerful brush tools for your design work. If you are weaned on Photoshop for digital painting, GIMP might be the more familiar Open Source app for you, but choosing Krita as your design tool works better for any illustration work. Forget the cloud service that Adobe is now running for its latest versions of Creative Suite. Compatibility issues with gear and geographical location availability of technical support makes cloud design tools too unwieldy. Not to mention the cost of each upgrade. If your internet grid goes out, your PC won’t run Adobe Creative Suite off the cloud. Imagine the horror of having your entire design workforce dependent on such a work tool environment. Get a Linux OS distro, for KRITA, you have a choice between Ubuntu Studio or the latest version of KDE—which is Krita's native OS and distro developer. Download the OS and install on your computer, then run Krita and download all the packages you need to make Krita system compatible with your computer such as device drivers for stylus, video cards and more. Right Clicking on the canvas allows you to pull up your favorite drawing tools, including the color wheel. This allows your work flow to be more intuitive than adjusting your work method to the set interface tools like the way the Photoshop and Windows painting apps work. Color wheel allows you to pick your paint color range off a tool on the desktop and you can have your color wheel appear as a wheel, a square, be luminance based and more. Color history tracks all the exact paint colors you pick as you go along your work. If you want to use the same color, just go over the color history tool and set your paint brush to work with the same hues and values again. These are custom adjustable drawing guide markers that help you draw better. You can set vanishing point, parallel points and other kinds of drawing assistants for skewing or framing the perspective of your illustration or image to your preferred POV. Your brush tool too is automatically snapped to this guide in order to help you draw your object in perspective. One of the most powerful tools of Krita. Krita's brush editor for some digital artists already using the drawing app, is its most powerful feature. The tool has dynamic settings for adjustable properties such as pressure, time, distance, speed and more. Each brush can even be turned into a burn/dodge brush, or into a transformation tool. Krita has special brushes for custom coloring applications. The grid brush snaps to a grid that will never change, no matter where you click on the canvas, if you keep the same brush size. 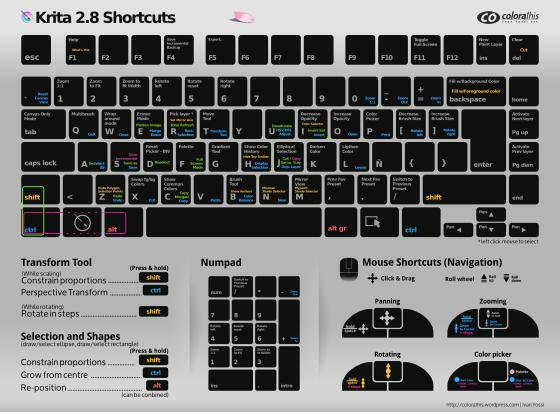 This is a powerful tool for pixel artists working on game design or icons! In certain instances when drawing or painting, you suddenly want a larger canvas and have no way of blowing up the work space without distorting the image. Not with Krita. Your layers are automatically extended if you draw beyond the canvas. Krita has simple power features that make digital painting easier and fun too. Multiple Wacom tablet handling is now possible as well as using them on multi-screen. The photo here is a bit extreme ; but was a successful test at home with a Cintiq and three other tablet connected. Drawing simultaneously on two instances of Krita opened on two different screens. This feature helps octopus user with a Cintiq or a laptop with an active screen reacting as a tablet plus an external classic tablet connected. . If you want to see other people show you how to use Krita, there are plenty of You Tube reference videos showing digital artists—from seasoned digital painters to kids making manga drawings, all of them creating very good, professional quality illustrations with KRITA. Open Source advocate, David Revoy is one dedicated Krita user who has plenty of video demos and even a website showing what kind of work can be done on Krita. One thing to take note of: open source programs aren't supposed to be backward compatible with Photoshop or other Adobe software: The KRITA native file format won't be readable in licensed software programs. But if saved or exported as industry standard image formats like PNG or JPG and the higher resolution image formats, your work can be opened in Adobe Creative Suite as well. Play-testing digital illustration tools like Krita let professional design-creatives and even digital design students get more comfortable with better work tools. In the same way that craftsmen try out new paints, markers, canvass, or pastel crayons for their painting projects, getting your design projects done on KRITA shows you how much Open Source drawing and illustration software has going for it as a better choice for digital painting and illustration design. Design schools in Europe are already migrating away from licensed software because of the cost effectiveness, plus the unmatched FREE upgrade and support advantages. 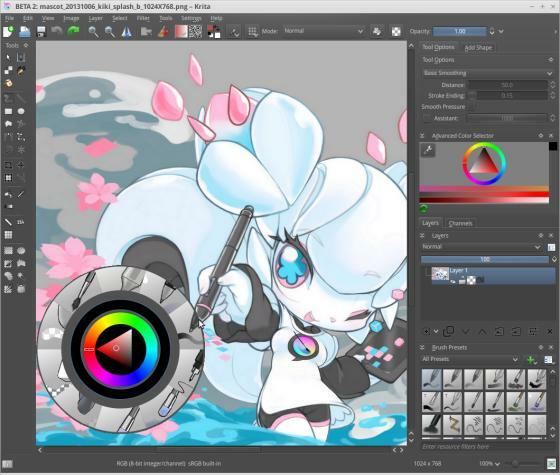 A French university has already dropped Adobe Photoshop in favor of KRITA for its entire curriculum for digital design and illustration.